This is especially satisfying for a couple of reasons. It’s the first time I’ve reached VK using the Ultimate 2 kit and a simple wire aerial. I’ve managed it on 20m using the Hexbeam but not with my random length doublet and smartuner. Secondly, it’s amazing that any signals were received at all because it’s IARU R1 Field Day at the moment and the band is full of loud CW. 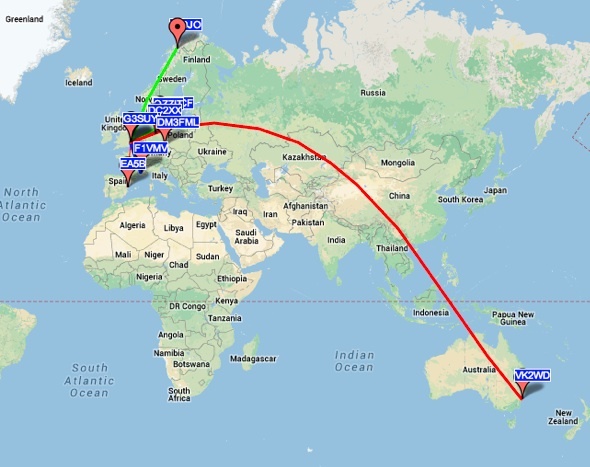 This entry was posted in Amateur radio, HF, WSPR. Bookmark the permalink.